When ‘Chakradhar Samaroh’ was mentioned to me for the first time, the name appealed to me right away. It not only sounded very catchy but powerful too. To my ignorance, little did I know that there was much more to an interesting name. It wasn’t just an occasion but one of the grandest celebrations of traditional artists, musicians and dancers of India. Named after one of the biggest patrons of dance and music from the royal family of the state, it is internationally acclaimed and celebrated cultural fests of India. 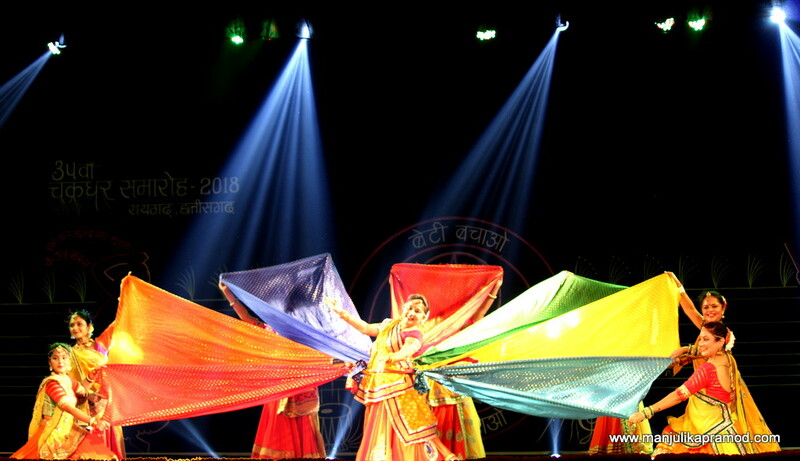 No wonder, the legacy of enthralling performances year after year have propelled Raigarh on the cultural map of India. 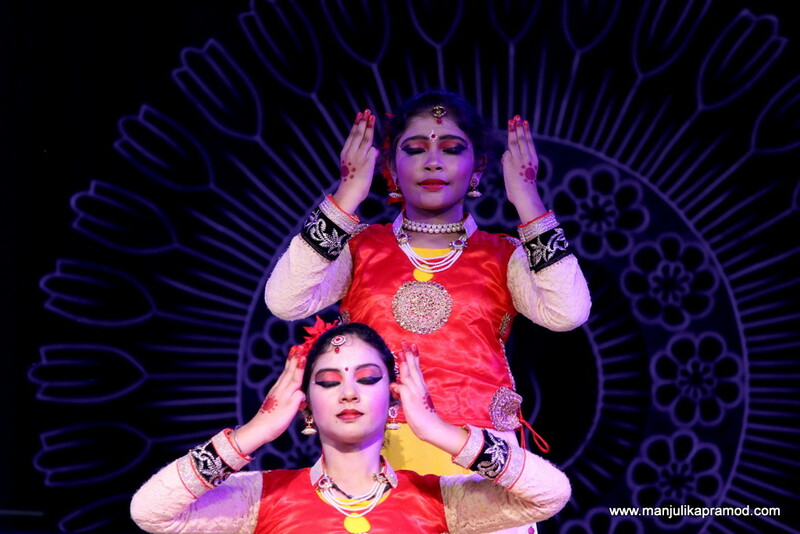 2018 marked the 34th year of Chakradhar Samaroh. Personally, the opportunity to visit Raigarh and to be a part of this cultural extravaganza promised a different kind of experience and I was up for it immediately. I knew it would be enriching in many ways to the traveler and the writer in me. Moreover, it was like traveling for a local celebration beyond discovering the landscape and people. Also, I was excited at the thought of catching up the festive vibes of Ganesh Chaturthi in Chhattisgarh this year. 4 days were well spent between Raipur and Raigarh, giving me my first impressions and memories of the state of Chhattisgarh. It all begins from Maharaja Chakradhar Singh and I am sure you know now where does the event gets it name from. My humble initiative to trace the history of Chakradhar Festival introduced me to the royal Gond family, Maharaja Bhupdev Singh and the genius Maharaja Chakradhar Singh Porte. The latter was a great musician, tabla player and the skilled dancer who ruled over Raigarh from 1924 to 1947. During his reign, he passionately followed his love for music, promoted it and also wrote books on it. He popularly came to be known as the Sangeet Samrat of Raigarh. And eventually, Raigarh won the status of Sanskardhani i.e. cultural capital of Chhattisgarh. A number of musicians and dance performers hail from this region. Had I not visited the cultural extravaganza this year, I wouldn’t have known the essence, the vibes, the level of excellence and last but not the least, the distinguishing character of the whole event. You got to be there to enjoy it along with the locals and visitors. The whole city goes euphoric about it. Every year, celebrated artists and exponents from all over India visit and display their arts. 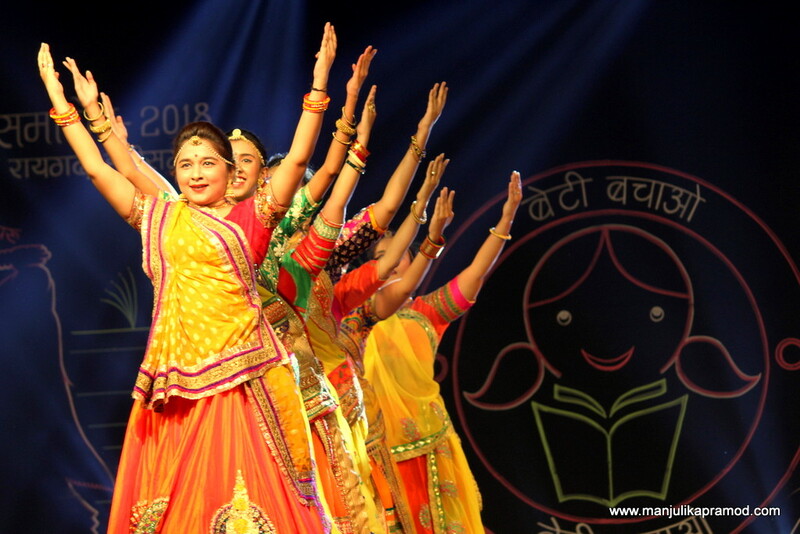 For 10 days, the town rejoices over great cultural performances. After attending to their daily mundane, the locals spare time for the evening and come down to Ram Leela maidan to attend the live performances of their favorite artists. There are visitors from other parts of the country too. 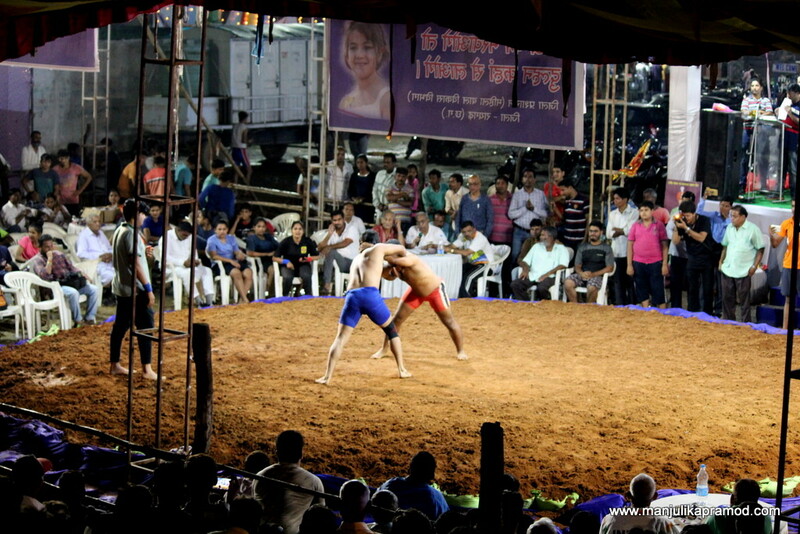 Wrestling matches were quite a delight at the 10 days cultural fest. The blackboard in the background was decorated with a new thematic chalk art everyday. There is no direct flight so train is one of the best ways to commute from the capital city, Raipur to Raigarh. I started in the afternoon around 2 p.m. and reached the city comfortably by 8 p.m.in the evening. The district was basking in the limelight and fandom of Ganesh Chaturthi pandals, Disney land Mela and Chakradhar Samaroh. I was pleasantly surprised to see the markets, houses and streets lit up like Diwali. The aura of festivity that hung around was infectious. Despite the fact that Raigarh is not a touristy place but a small town, has no luxurious hospitality, is raw and untouched with urbanization, it felt good to be there. It conveyed warmth and simplicity. I do not claim that such places are one of the best but they are definitely soulful and are mirror to life in smaller towns. Chakradhar Samaroh promotes both men and women wrestling. It was great to see some of the promising candidates under one roof. You have to be part and parcel of any occasion to imbibe the moods, ambiance and thrill of the event. Same goes with Chakradhar Samaroh. It is a distinct celebration of performing arts and the beauty of the event is that this cultural programme of songs, music, sports and dances takes place for ten days at a stretch. This was my first day and after having a good see around of the local things in the afternoon, I landed up at the venue (Raam Leela Maidan) at 6 p.m. to catch up with the semi final matches of wrestling. I had heard locals talking about it. The fights were going on in full swing and I loved the fact that there were lot of spectators as well as people from the administration, sitting there and encouraging the participants. A huge crowd was cheering the players. Along with the male participants, a very promising young batch of female wrestlers from all over the country was also there. All these girls were the best in their state and were aiming to prove their feats and fetch international medals for the country. So it was good to see that wrestling was no longer a gender biased sport and it was being promoted at a cultural fest . The schedule for the evening promised a series of dances and plays. 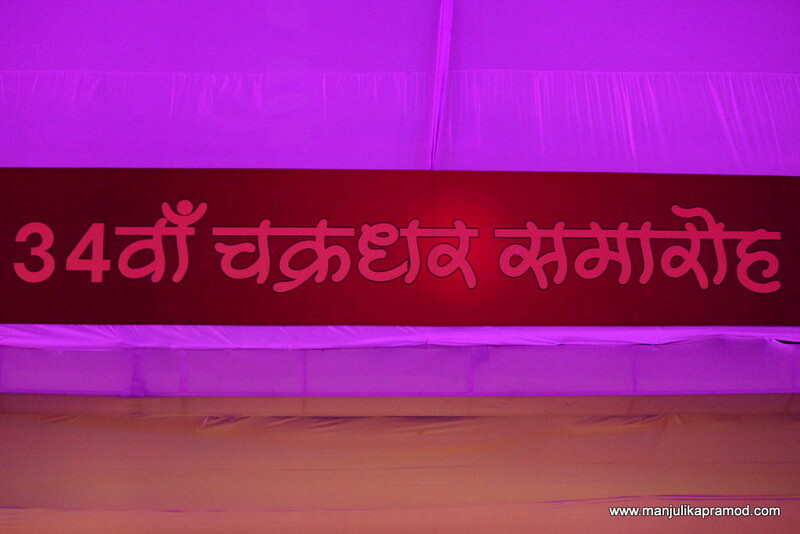 The event started on a high note with a beautiful cultural exchange between the state of Gujarat and Chhattisgarh. The artists from both these states took turns to showcase their traditional dances. Some engaging group performances left us with no time to focus anywhere else. These are some of the moments when we actually relish our culture and our eyes twinkle with joy and pride. 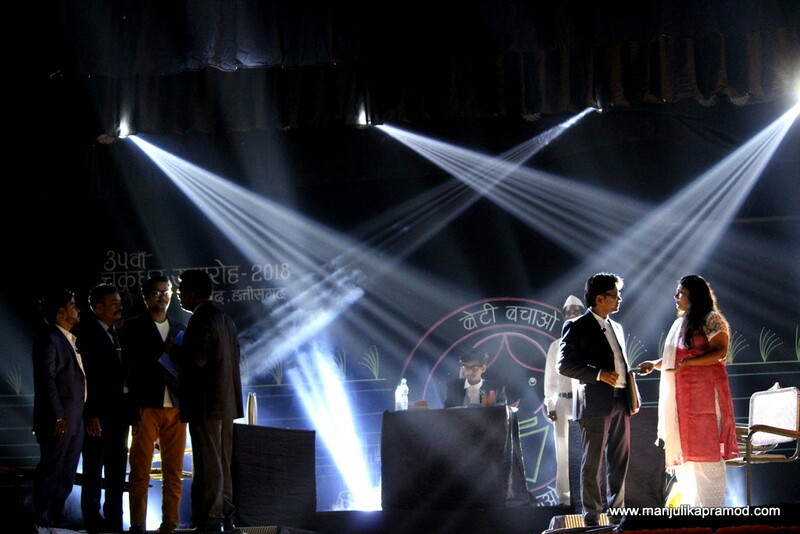 The play and drama that followed touched upon social issue of prejudice against women. It was good to see such strong messages were being sent out through this event. Even if performances like these impact one person and make him/her change their behavior, it is a great win for the society. I was totally engrossed in the theatrical performance and it reminded me of days when I used to be part of school and college plays in my teens. It felt very good to see that wrestling was being sportingly enjoyed at the Chakradhar Samaroh. The day was well utilized in exploring some of the nearby attractions. The local driver keenly showed me around as per my request. He drove me down to the the longest bridge at Surajgarh measuring 1,830 meters over the Mahanadi river. From there we visited the Chandrahasini Devi Temple which makes a very popular temple and an important landmark in Janjgir-Champa district. The sunset meant that it was time to get ready for the event and be glued to our seats. Whole of Raigarh was eagerly waiting for the performances of the day. Some amazing dance groups had come down from different cities and took on the centre stage. The divas enacted tales of strength of woman and enthralled the audience with their outstanding performance. What lay for the later part of the evening was even more musical. 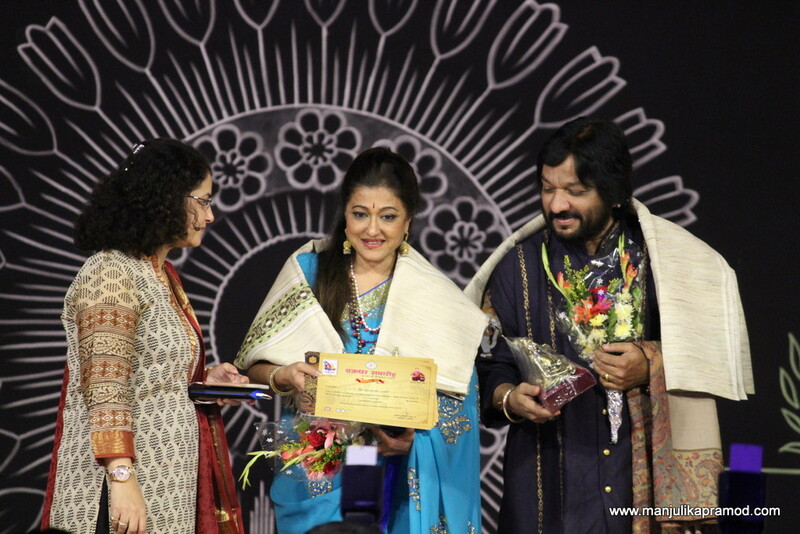 Roop Kumar Rathod and Sunali Rathod, one of the most talented singers, a couple blessed with mellifluous voices joined us for the night. I am sure no one slept till they sang till 2 p.m. in the night. I must applaud the district administration and their team for augmenting the cultural image of our country by organizing this event year after year. This year it was very well managed. One of things that really stood out for me was that the locals were well behaved and I did not witness chaos of any kinds. A huge area like ‘Ram Leela maidan’ was covered and decked up with enough seats up for grabs. Indian dances and our folklore is one of the best in the world and such events reflect the richness of talent in all parts of the country. Invitations are sent out to several world-renowned artists, they are requested to come down to Raigarh to be a part of this fest, they accept it with graciousness and as per dates, they perform for the locals and guests and honor the legacy of the spirited Raja Chakradhar. Ustad Allaudin Khan Sangeet Academy and the Chakradhar Lalit Kala Kendra are also two institutes which have played a very positive role in keeping this event going for several years. I would like to applaud everyone who made the event possible this year. If you get a chance, do go for it next year. I am totally not fan of wresting and I would’t be interested to see it. However the dances are so beautiful and full of colors! That must be a delight to participate. Not so sure about wrestling but I would love to see the dancing. I love watching traditional dance shows especially at festivals like this which are for locals not tourists. And the women’s outfits are so beautifully colourful. Great photos! Must say I had never heard of this even and your post has surely showed me a part of India and festival I was not aware of. Love the various aspects and wrestling which needs to be promoted more by the Indian Government surely takes my fancy. The colourful dances is a great way of sharing the culture with my kids. A good road trip indeed and a place I would love to visit on my next trip to India. Wow! I’m exhausted just reading through your post and the intense program of the event! What a wonderful experience that must have been. So much colour, music, culture and I’m sure a ton of food! And I had no idea India was os into their wrestling! It is commendable that the Government of Chattisgarh has been successfully managing to make this event happen year after year. I like the folk music, dance and theater the most. It s not everyday that you get to witness such brilliant work by local artists. I am definitely going back again next year. Wow! such a beautiful festival. I did not know they were into wrestling. It is nice to know that both men and women are engaged in this sport. I love it! I like that there are both women and men wrestling and dancing. If you like to do it do it! Not to get off topic but India has made some pretty awesome changes for their female dominated population. This festival would be fascinating to see in person.